If you can’t afford to give your bathroom the luxury of a waterproof TV set, but, you wish you could! 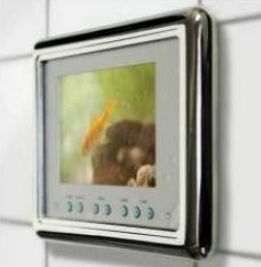 Then we have a wonderful option for you that is affordable too, the IP Rated Bathroom TV. The waterproof TV is designed to fit into a wall space approximately the size of a tile. The chrome-finished panel features Sharp’s LCD TFT 5-inch screen (diagonal). The TV comes with a standard 3 pin mains plug, a waterproof remote control, aeriel connection, A/V leads to connect to a DVD/Video etc. The TV features a contrast ratio of 300:1 and it sells for just £169.99. Turntable speaker mixer – Music is life!